WASHINGTON, DC — The United States must take “bold action” by the end of 2017 to prevent Christianity in Iraq — the cradle of Christendom — from disappearing in just “a few short years,” warns former Rep. Frank Wolf (R-VA). Wolf’s comments came via written testimony prepared for a Senate panel hearing Wednesday on the future of Iraqi minorities after the Islamic State (ISIS/ISIL) is defeated. I am sad to say that if bold action is not taken by the end of the year, I believe a tipping point will be reached and we will see the end of Christianity in Iraq in a few short years and a loss of religious and ethnic diversity throughout the region – a loss which will not be regained and could result in further destabilization, violent extremism and terrorism across the Middle East. In other words, ISIS will have been victorious in their genocidal rampage unless concrete action is taken. Wolf noted that U.S. assistance to minorities in Iraq has failed to reach Christians, Yazidis, and other groups. According to Wolf, ISIS remains a threat to Iraq’s minority groups, but minorities are also concerned about the presence of a Baghdad-sanctioned Shiite militia, the Popular Mobilization Units (PMU/PMF). While I went expecting to hear further reports about security concerns related to ISIS, I was surprised to find that most individuals I spoke with were concerned about the various military factions controlling their towns and villages – in particular, the Hashd al-Shaabi (also known as the Popular Mobilization Forces or PMF). Iran maintains influence over the PMF militias, legalized by the Shiite-led government in Baghdad as an official component of the Iraqi military late last year. The Hashd-al Shaabi militia, which is backed by Iran, and other militia groups are filling the vacuum left post-liberation. This is part of the Iranian goal of creating a land-bridge from Iran, through Iraq to Syria to reach a port on the Mediterranean. Such a land-bridge will allow Iran to move fighters, weapons, and supplies to aid Hezbollah and other terrorist groups. This will be a direct threat to Israel and the United States military as well as others in the West. Although PMF troops are predominantly Shiite, the force also includes a few Sunnis, Christians, Yazidis, and other minorities. Some Yazidis, or Yezidis, claim a lack of support from the United States and other countries has pushed them into the ranks of the Iran-allied PMF. Nevertheless, Wolf said the Shiite militiamen had complicated the lives of some minority groups, namely those in the Yazidi-majority Iraqi town of Sinjar. The United States has officially declared that Christians and other minorities in Iraq have been victims of genocide at the hands of ISIS. However, they were still looking for the U.S. government to take meaningful action to help them a year after the genocide declaration. Unfortunately, to a large extent, U.S. Government assistance has not been forthcoming to Iraq’s Christian and Yezidi communities even though the President, Vice President, Congress and Secretary of State have declared them victims of genocide. Many of the displaced Christians, for example, have had to seek the mainstay of their aid from private charitable sources on a piecemeal basis for over three years. This is becoming increasingly difficult as many individuals who give to humanitarian organizations are facing donor-fatigue. Wolf acknowledged that the United States had already invested significant blood and treasure in promoting peace and stability in the Iraqi region. Specifically, he said more than 4,000 Americans have paid the ultimate price, and the United States government has spent an estimated $2 trillion of U.S. taxpayer money on Iraq. The ISIS terror campaign in Iraq dealt a significant blow to all minorities, particularly the Yazidi community. 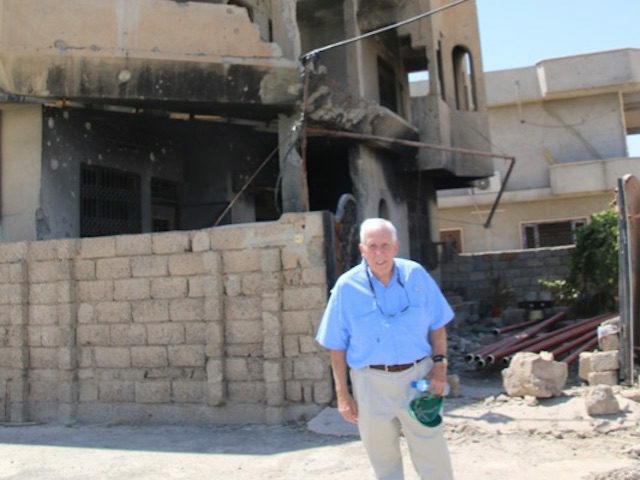 Soon after visiting Iraq in August, the congressman told Breitbart News that, despite the uphill battle Christians in Iraq face, there is hope for them — one of the oldest Christian communities in the world.